BOSTON — Red Sox ace Chris Sale and manager Alex Cora both made early exits in Game 1 of the AL Championship Series against the Houston Astros. Sale lasted just four innings Saturday night, giving up two runs on one hit and four walks. Cora wasn't far behind the lanky left-hander going back to the clubhouse. 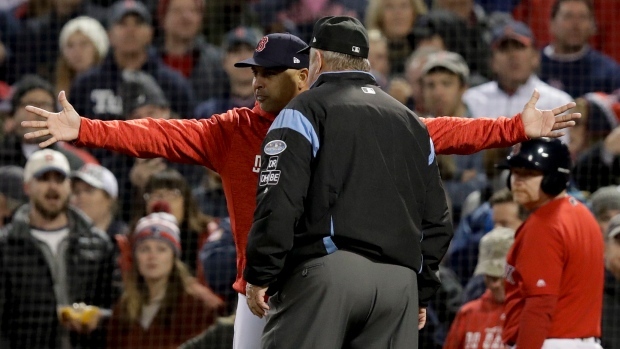 The rookie manager was ejected in the bottom of the fifth inning with the game tied 2-2 after arguing a called third strike on Andrew Benintendi that ended Boston's first rally of the game. Houston took advantage in the second. Sale got two quick outs, but then walked Carlos Correa, plunked Martin Maldonado on the hand with a fastball and walked Josh Reddick. Springer followed with a hard grounder past third baseman Eduardo Nunez to put Boston ahead 2-0. He jumped back up to about 95 mph in two effective outings against the Yankees in the Division Series, but was sitting a relatively sluggish 90-93 on Saturday. The 29-year-old allowed five hits and two earned runs, striking out nine over 6 1/3 innings in his ALDS Game 1 win over Yankees. He also came on in relief during Game 4, retiring all three batters he faced during the eighth inning. Saturday night's start harkened back to the rough outing he had in his post-season debut in Game 1 of last season's ALDS against Houston. Sale gave up seven earned runs in the five innings he pitched in that outing, yielding a pair of home runs to Jose Altuve and another to Bregman in a loss. Sale came on in a relief appearance in Game 4 of that series as well, holding the Astros scoreless through four innings before allowing two runs in the Red Sox's 5-4 Game 4 loss as Houston wrapped up the series, 3-1. Cora stuck around long enough to pull Sale and use Mitch Moreland as a pinch hitter in the fifth before he was tossed while standing up for Benintendi. There were two out, two on and two runs already in when Justin Verlander threw a 98 mph fastball to Benintendi near the outside edge for strike three. Benintendi slammed his helmet and bat down and pleaded his case with plate umpire James Hoye before Red Sox coaches ran in to get between them.